But if we drill into the intent of the regulations we can see that OSHA does not require everyone who enters a confined space to be backed up by a rescue team, they simply require you to have a means of rescue. Now clearly, the means of rescue needed at your facility may well be a twenty-person team with advanced rope rigging skills, but it may also be an attendant cranking a winch or something between these extremes. So how much rescue capability is enough at your location? 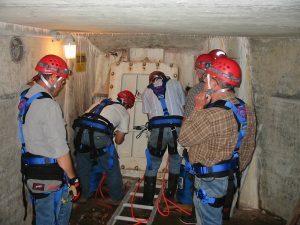 An on-site confined space rescue team preparing to enter the scroll case of a hydroelectric dam. If your facility truly has a means of rescue that reflects the hazards of your permit spaces, then your rescue capabilities will reflect the characteristics listed below. If these aren't evident during a drill (or actual rescue), then perhaps it might be time to plan ways of addressing these deficiencies. Someone is in charge: The team uses some type of Incident Command System (ICS) to control the rescue scene, account for all rescuers, and integrate with additional resources as they become available. A thorough hazard size-up is performed: Getting a rescuer hurt is unacceptable. All possible hazards need to be assessed. If they are present, they need to be abated. If all the hazards are truly ruled out, then the only remaining possibility is a medical emergency and the team can proceed accordingly. Equipment is available: If the equipment is not available on the work site, the team can access and move the equipment to the site with little or no delay. In addition, the equipment was packed and inspected after the last use and is ready to be deployed. The team knows beforehand how they will access, package, and move the patient: While there may be complications, by and large the team members can envision the steps and equipment needed to get the patient to the opening and to a place of safety. The team takes advantage of lessons learned: After each drill, the team follows a formal process intended to uncover and address deficiencies. Possible ways of improving are recorded. All the needed information and procedures are written down: Our brains serve many useful functions, but recalling complicated information in an emergency is not one of them. Pre-plans are not simply a best practice, they are often the only thing standing between a rescuer and a broken rescuer who is of little or no use in the rescue effort. The written pre-plans must be concise, up to date, and accessible when needed. When your teams practice, it should be evident whether or not they reflect these characteristics. If they do, then congratulations! You know that if called to perform, there is a high likelihood that they will succeed. If not, then your team may be overdue for a tune-up.